The Senate Finance Committee unanimously approved a $211.4 billion budget Wednesday, $1.6 billion more than the budget recently approved by the House and a $9.3 billion increase from the current two-year budget. 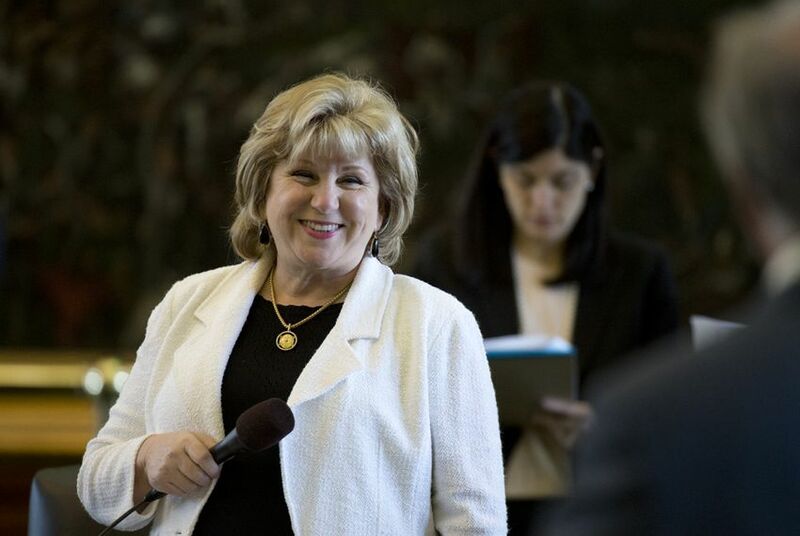 Senate Finance Chairwoman Jane Nelson, R-Flower Mound, said she expected the Senate version of House Bill 1 to be debated by the full Senate next week, “probably Tuesday.” After the Senate passes a budget proposal, a conference committee made up of House and Senate members will hash out a compromise version. “I feel like I just finished stage one of labor, but the baby’s not here yet,” Nelson said. The 2016-17 budget plan spends $107.4 billion in general revenue, the closely watched portion of the budget that lawmakers have the most control over. That’s up $12.2 billion, or 12.9 percent, above the current budget, which spends $95.2 billion in general revenue. It’s also nearly $3 billion higher than the House’s proposed budget, which spends $104.6 billion in general revenue. After the Senate Finance Committee hearing, Nelson said the House and Senate versions of the budget are much closer than they have been in past sessions. As in the House, Senate budget writers left billions of dollars on the table. State Comptroller Glenn Hegar told lawmakers in January that they had $113 billion in general revenue to work with, as well as a Rainy Day Fund that’s projected to grow to $11.1 billion by the end of the next biennium if left untouched. The Senate budget leaves $1.3 billion in spending available below the constitutional spending cap, according to the Legislative Budget Board. The House left $2 billion in spending under the cap. However, that figure does not include $800 million in additional public school funding that House leaders have said they hope to add to the final version of the budget. Breaking the spending cap requires a majority vote in both chambers. Republican leaders have said they have no plans to attempt to break the cap this session. The Senate budget includes about $4.5 billion set aside for tax cuts — divided nearly evenly for cuts in property taxes and for cuts in franchise taxes paid by businesses, according to the LBB. The House budget does not include tax cuts. House Ways and Means Chairman Dennis Bonnen, R-Angleton, unveiled a House tax cut plan Wednesday focused on a cut in the sales tax rate as well as cuts to the franchise tax. The two budgets also differ significantly on border security, with the Senate spending $811 million and the House spending $565 million. Nelson touted the budget as one reflecting the “shared priorities” of the entire 15-member Senate Finance Committee.